CITY PARK IN APPLETON, WISCONSIN, is one of those parks that causes you to linger and appreciate. 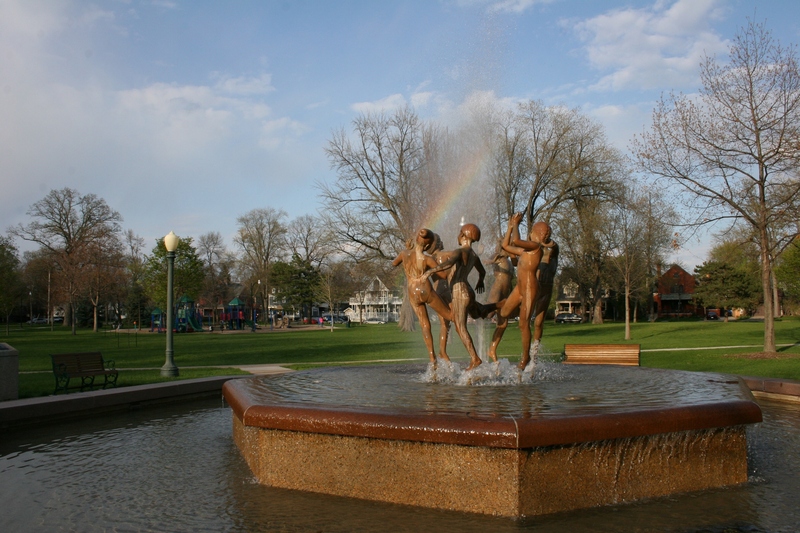 “Ring Dance” by sculptor Dallas Anderson serves as City Park’s focal point. Private donations paid for the $483,000 fountain sculpture which was dedicated in August 1996. 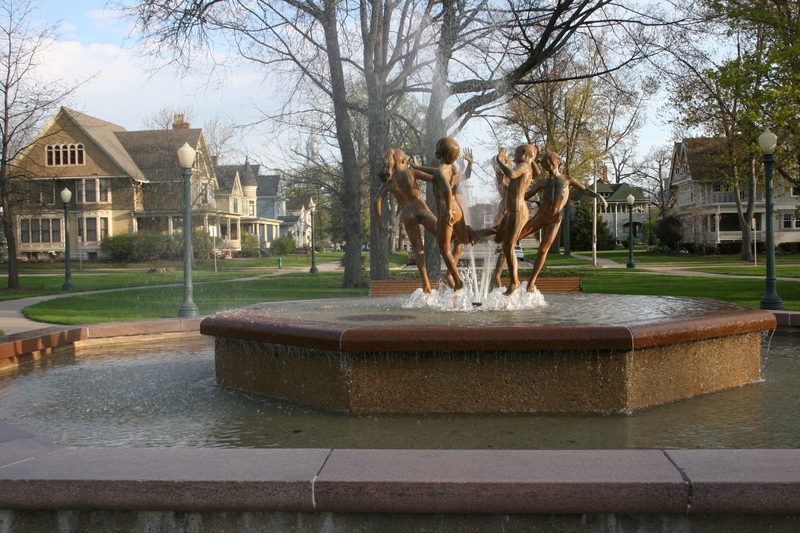 It’s the setting as much as the fountain sculpture focal point that pull me into this neighborhood park next to Lawrence University on the eastern edge of downtown. Spectacular one-of-a-kind historic homes define the neighborhood. 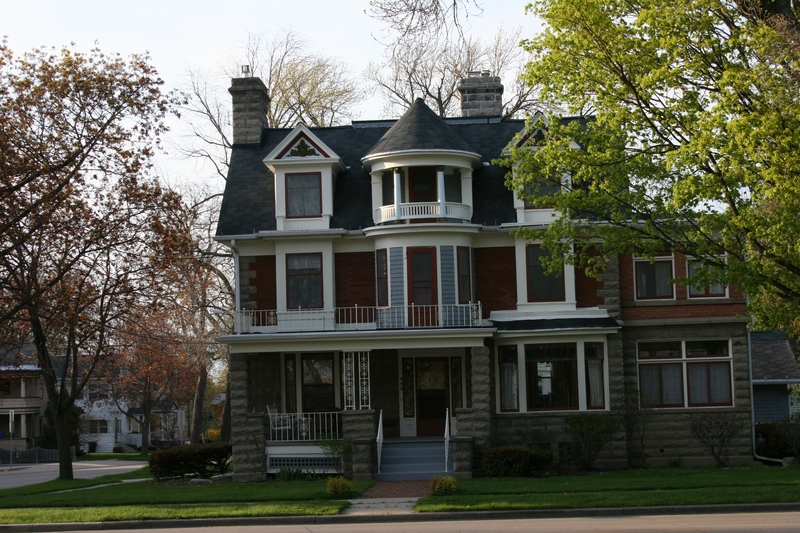 Historic, sprawling homes draw my eyes to inviting front porches and turrets and other architectural details. Homes so lovely I would move into any of them if I had the money. 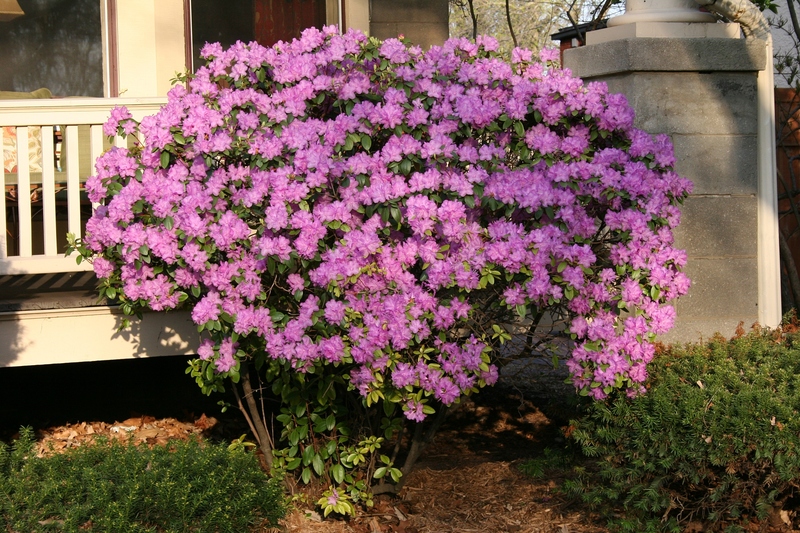 A beautiful bush flowers during my May visit to City Park. Rather, I covet that which I cannot own, imagine gleaming wood floors creaking with age, thick plaster walls, shining banisters, banks of windows streaming sunlight into rooms pasted with cabbage rose wallpaper. 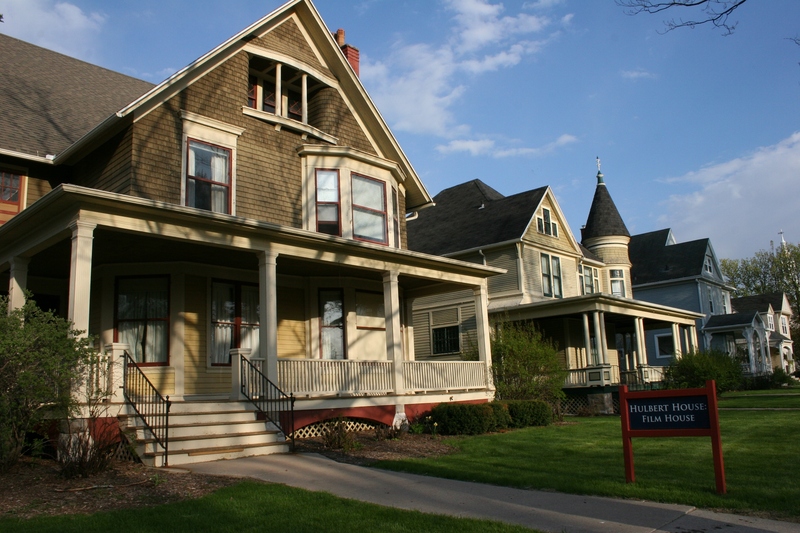 The Hubert House Film House, right across from City Park, is part of Lawrence University. The writer in me is writing the stories of these homes as my eyes scan exteriors while strolling the park perimeter. Impressive First English Lutheran Church. 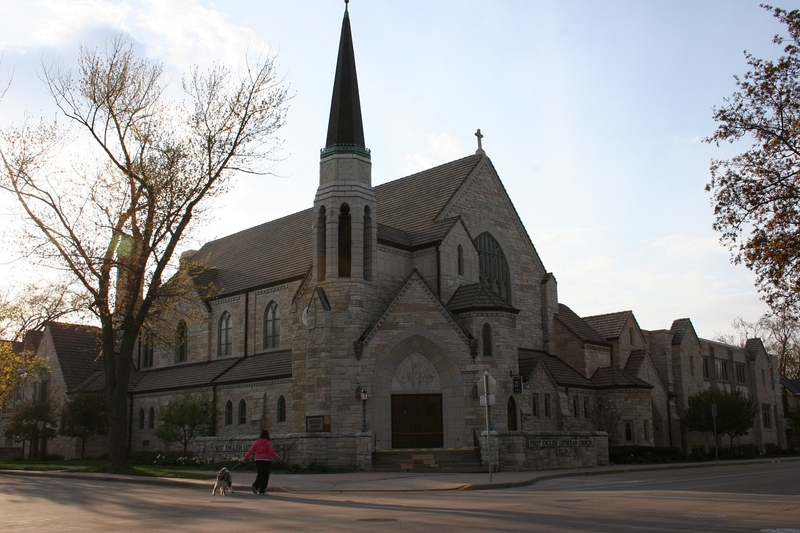 And then, I pause to study First English Lutheran Church, a strong stone structure that dominates a street corner. Stunning. Moving in as close as I can without water spraying onto my camera. 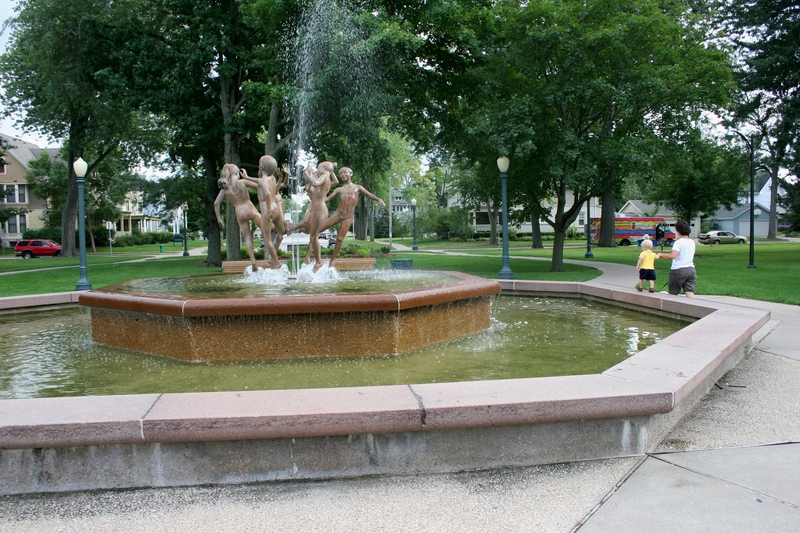 Back in City Park, the lure of water leads me to the fountain, where sculpted children dance, ankles intertwined. Fountain information imprinted upon a plaque. If I could, I would join the circle, the “Ring Dance,” washing away worries. But on this evening, sunlight on water beaming a rainbow, I simply appreciate the moment. Rush of bubbling water. Sunlight fading in the golden hour. Time here, with the man and daughter I love. 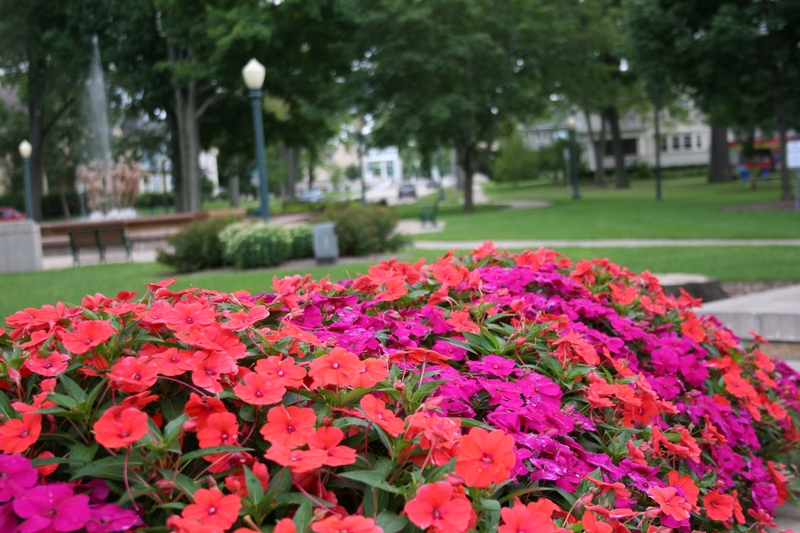 Impatiens fill planters in the park. A food truck stops at City Park. 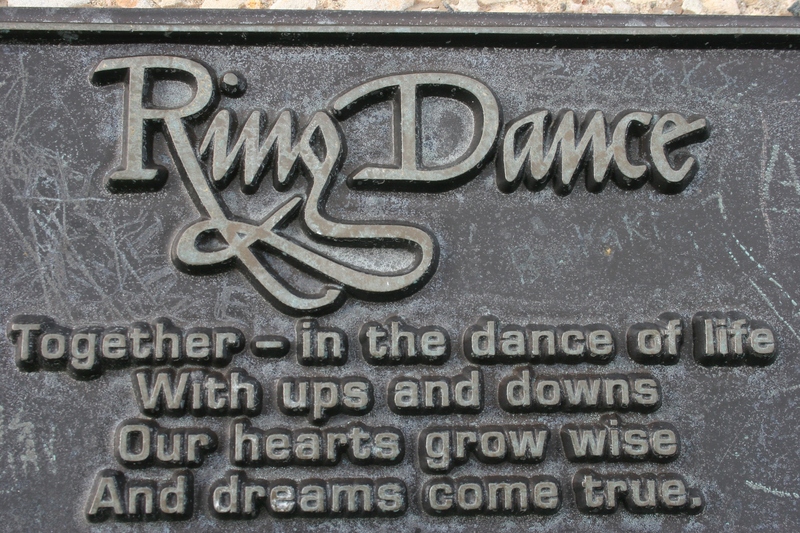 FYI: For more information about “Ring Dance” sculptor Dallas Anderson, click here. This coming Sunday, June 22, City Park, 500 E. Franklin Street, hosts the annual Juneteenth Festival sponsored by African Heritage, Inc., and the City of Appleton. The noon to 5 p.m. free admission event celebrates freedom, unity and community. The fest includes performances by Chicago-based Ayodele Drum & Dance, a Michael Jackson impersonator and other musicians; showing of “Stone of Hope: Black Experiences in Appleton,” a pop-up museum exhibit; games; and children’s activities. Food vendors will also be on site. For more information about Juneteenth Festival, click here. Click here to read a previous post from City Park. And watch for a future post on an unusual tree discovered here. Those homes are so beautiful! Rows of Victorian “painted ladies”……the turrets draw me (and DH) imagining what the interior looks like, what is the room……..a sitting room, library/reading area or maybe a bedroom? Lovely post……needed at this time of inundation!!!!! I could look at houses like this all day. I remember, growing up, taking the Greyhound (by myself) to visit my Aunt Rae and Uncle Bob in south Minneapolis. Aunt Rae and I would bike around the city and I was simply awestruck at the beautiful homes (like these) around the lakes. The homes around Lake Calhoun and the homes around the Cathedral (St. P) on Summit Ave. Awesome!!!! I’m familiar w/ the houses along Summit. Awesome is right. On Flag Day, June 14, I attended the annual Flag Day parade in Appleton. On this day they were honoring the Marines. The parade was awesome.. lots of flags, bands and floats. If you get the chance to attend, go. I know I plan to go again. An added bonus was Tim’s birthday. When he was little, he wondered how everyone knew it was his birthday by putting flags up for him!! Kids do say wonderful things. I love that story about Tim. And a Flag Day parade–that’s a great idea. This is most assuredly one of the most delightful fountains I’ve ever discovered. Not too familiar with the food truck concept. We have a BBQ one in Faribault and a Kona Ice one. That’s it. But then again we are not exactly a major metro area. 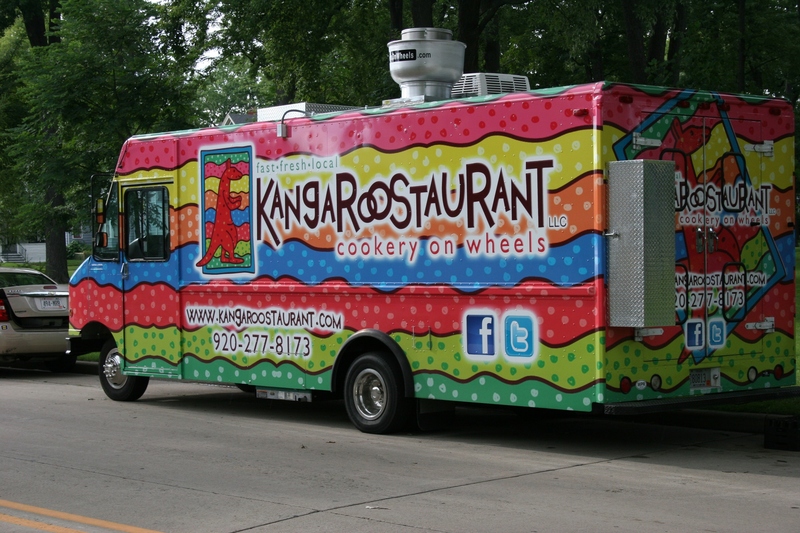 Love the food trucks in St Paul – Rice and Mears parks are great location to grab a tasty bite. Ah, Mears Park…I have family living right across from this park, but have yet to explore it. Love the old house. Makes me want to go in and snoop around. Snoop, snoop. That would be me. Imagine what we would discover. Love that you captured a rainbow in the one fountain photo – beautiful homes too – loving your captures 🙂 Happy Weekend! If you haven’t checked out today’s Owatonna People’s Press online, Renee, you should. There’s a story about flooding at River View Campground. Thanks and I will do that. I thought one might belong to your parents. These are really nice shots, especially the one where you tried not to get your camera wet! Those old houses sure do nudge daydreaming….I can see why you remember biking around south Minneapolis so fondly. Great houses to dream about. I came pretty close to getting my camera wet. Isn’t it interesting how, of all things I recall from those long ago annual visits to “the Cities,” I remember those houses. City Park is actually located in Appleton, Wisconsin, which is 300 miles from where I live. Just another reason for you to visit Wisconsin. I love old houses, too. As you know, I live in one. So when I see them, I also think — old wiring, poor insulation, and possibly leaking stone foundations! Ha ha. There’s always a downside to an old home, isn’t there? Lovely town and what a wonderful fountain. I can see why you enjoyed being in Appleton!!! Beautiful surroundings and a great destination,right? I love Appleton. It means visiting my daughter and spending some time in a wonderful city.